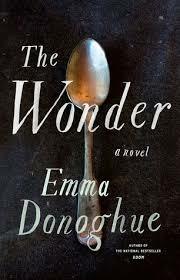 a book chick: "The Wonder"
my take: The heroine, a Nightingale trained nurse, is hired to keep a two-week watch over a young girl who claims to be eating nothing for four months. Is it a miracle, a divine intervention, or is it a hoax? Much of the 'action' takes place in the girl's small room, from the author of Room where ALL the action takes place in a small shed. Here she explores the nature of religious devotion, of English versus Irish, of superstitions vs fact, and of nurses versus doctors. I thought this was a bit boring for a while and then needed to find out was it a hoax!? As the past of the nurse and the Wonder are revealed, a compelling enough tale emerges. I had an interesting "book club" (in quotes because there are just two of us... but, "Where two or more are gathered"?!) discussion about this one - we agreed that it started out a bit slow but turned out to be almost a page turner by the end. But meanwhile there were plenty of things to ponder and discuss about the intersection of science and faith, women's roles, etc.